The lawn collection for summer is the most anticipated collection of the season, as women of all ages love to carry it in every style and design. And if the style is more trendy then it seems fascinating and alluring. The type of designs, prints and embroideries decide for the occasion you want to carry it. If it’s some formal occasion then obviously the embellishments need to be more tempting and heavy while for casual days you want to keep it light with only the digital or block prints over the vibrant and comfy lawn fabrics. 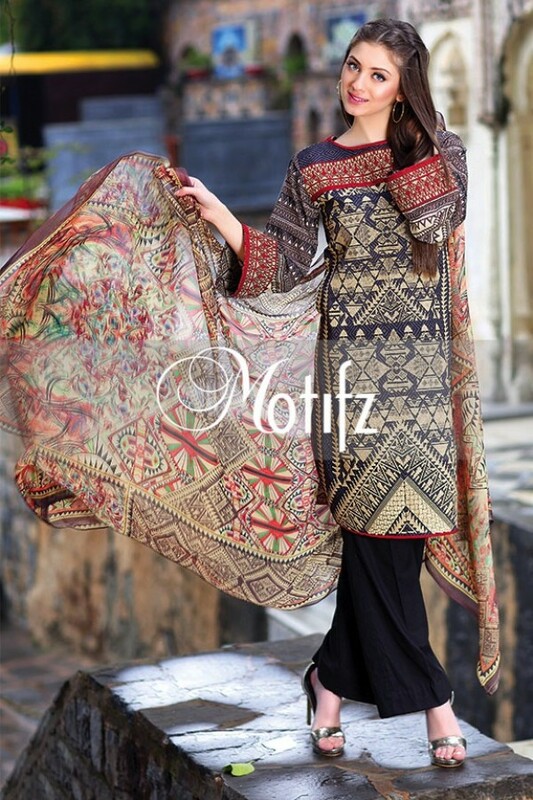 In the house of style, Motifz is a clothing brand that emerged on the front with its highly phenomenal stitched and unstitched fabrics. Their style speaks for great quality and variety. Successful gaining popularity among some girls and women, they have produced finest collections for all season, be it winter, summers or springs. 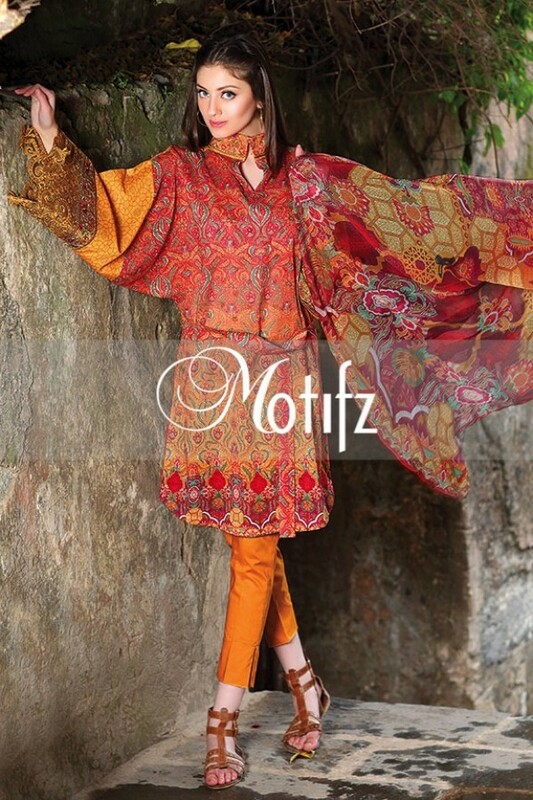 And this year, the wait is now over for the amazing Motifz embroidered lawn collection 2016. Though they have also produced the array of digitally printed lawn dresses which can serve for both formal and casual occasions. But their embroidered collection is specifically designed for all the festive, colorful and formal occasions going to held in summers. Refreshing designs using thread works, applique work, stitch work and fine work of beats, seems to signify the beauty of these dresses. The range included both the stitched and unstitched with surprisingly reasonable prices. 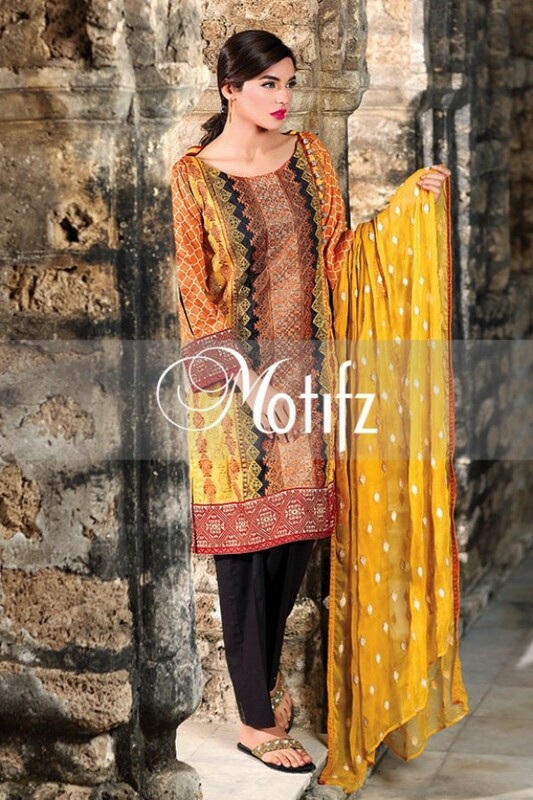 Prices range from 4700Rs to approximately 5400Rs for all the three pieces unstitched suits. The lace work tends to highlight the borders and the sleeves carrying net-work and floral embellishments. The designs of the motifs are highly unique and distinctive as it goes with the brand name and identity. These three piece suits comprise of an embroidered shirt piece with plain trouser piece coupled with colorful and dazzling chiffon, net or lawn dupattas. This collection unveils the scale full of hues which prominently defines red, white, blue, lemon yellow, grey in a tempting manner. What makes it more appealing are the contrasts that can be seen in the embroideries and adornments of these dresses. You can either carry it in modern cuts and style or can imply some traditional touch. The floral designs are created with the inspiration of blooming flowers of springs packaged with a blazing warmth of the summer. You cannot get enough of these once you visit the nearest Motifz outlet. 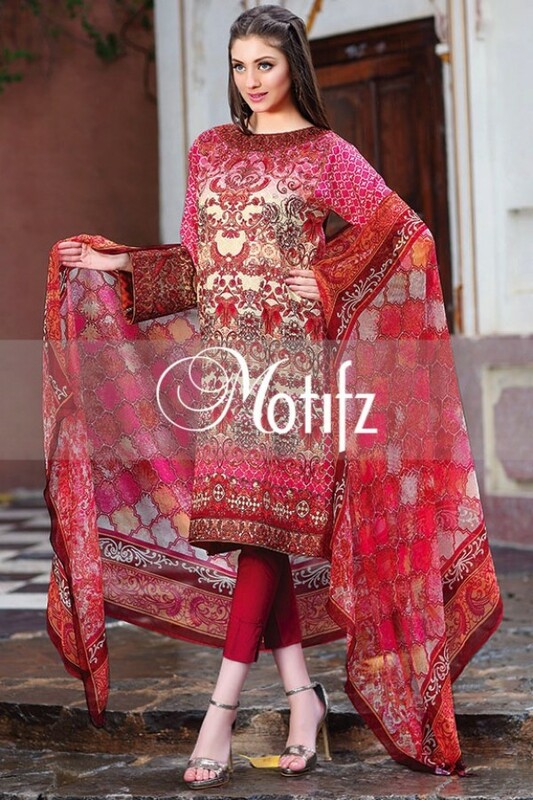 For the convenience of our viewers, we have collected the latest images of embroidered dresses out of the latest catalogues out now, available on all the web portals and websites of Motifz. 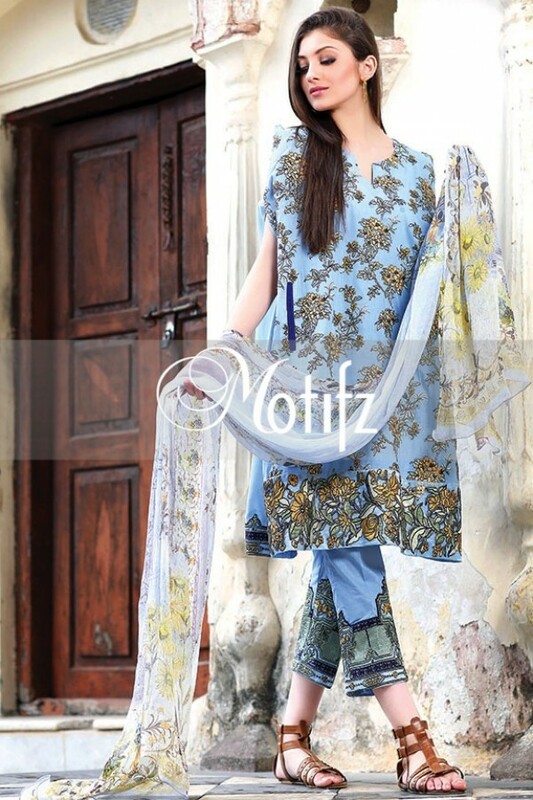 Grab the outfit of your choice with the alluring motifs from the house Motifz.